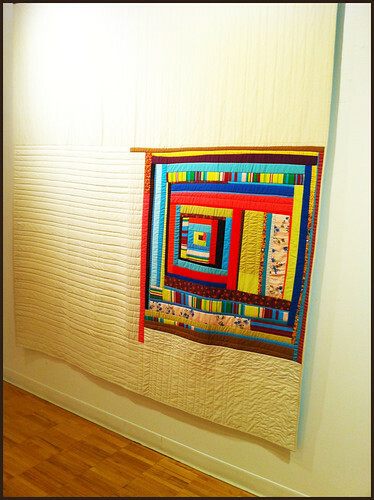 on saturday our little family bopped over to the university of bridgeport's arnold bernhard center gallery to see quilter denyse schmidt's solo show, any way you slice it. i've been a fan of denyse's work for several years now...and was eager to get a chance to see her work up close (and personal). a little review of sorts! the gallery is a part of the university of bridgeport; it being a saturday in late november, the place seemed pretty dead, literally and figuratively. there weren't many signs directing people anywhere (i only saw one small flyer for her exhibit by one of the entrances to the building). absolutely no one was milling around, on the campus, or in the building, or curiously, on the streets near the campus. kind of freaky. 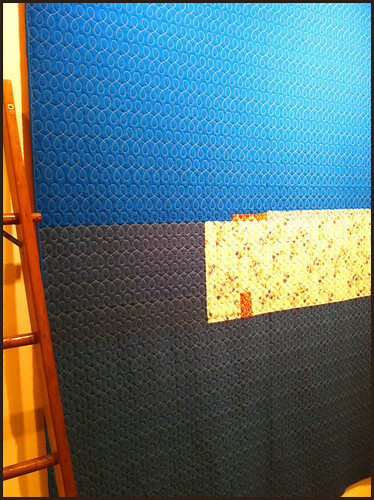 according to a blurb about the show on her site, the solo exhibition "showcases recent quilts as well as earlier examples to provide a sense of continuity and context for the current work." to set the scene for you: several beautiful quilts were hanging around on the walls of the room that held her show (see above, they are, allegedly, the recent work mentioned above); there was also a tv screen with a slideshow of projects made by various quilters and crafters using her fabrics or patterns (from her books and the like); examples of her mass produced finished quilts; samples of some of her quilt fabric designs; a binder filled with sketches and photographs that looked to be an illustration of her design and development process. overall, the exhibit was nice... but also kind of strange, and weak and/or weirdly lacking in the way of context: explanation, relationship of the pieces to one another, things of that nature. what i was yearning for was more words...words about denyse herself, perhaps, words that told more about the specifics of the works on display, and so forth. perhaps at the opening she was there to provide that context i was craving? i don't know. maybe i was blind and missed something? adding to the weirdness: two long tables along one of the walls were dressed with tablecloths and covered with stacks of empty, unused wine glasses, and the center of the room housed a collection of round cocktail tables. clearly there had been a party/talk/some event in the room in recent days but no one had bothered to clean up. seemed sloppy and strange and was kind of off-putting and distracted from the show. 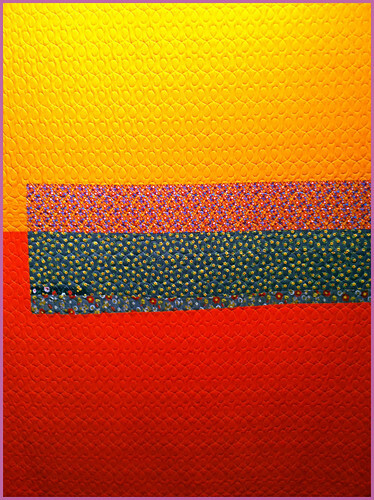 i really liked many of the quilts on display...denyse clearly has a studied sense of design and color, a studied way of balancing blocks of intense, organically arranged color and pattern against proportionately vast areas of solid color. her art training (she was trained at RISD) is clearly apparent; her work transcends the categorization of "craft," veering definitively into the realm of (modern) art. forget putting these pieces on a bed; they rightfully deserve a big wall for display, contemplation...and adoration. 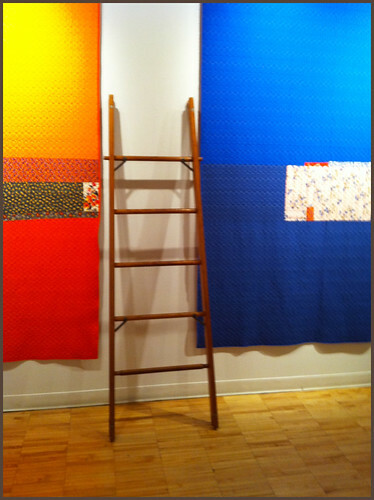 i especially loved the pair of orange and blue quilts (with the ladder placed between them); i'm having a big love affair with pairings blue and orange of late, so they really spoke to me. 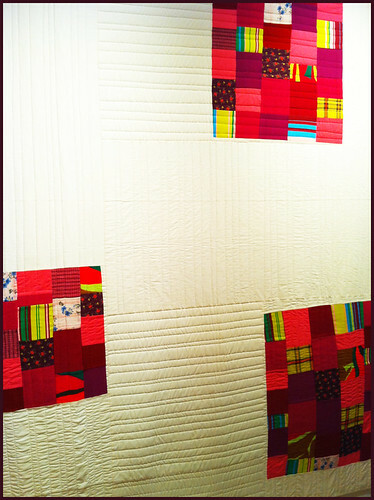 the off-white quilts with with the offset blocks with intense red, pink and green fabrics were also quite incredible. the camera on my iphone just couldn't do the colors and fabrics the justice they rightly deserved. 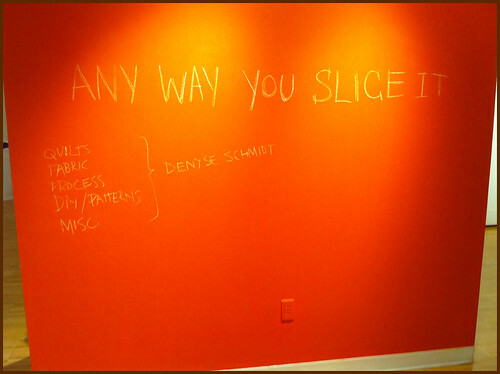 ALERT: if you're in CT/the northeast/NYC metro area: you can still go see denyse's show! it's running until december 3rd, 2010.